DADaPalooza: Review of Grug: We loved it! 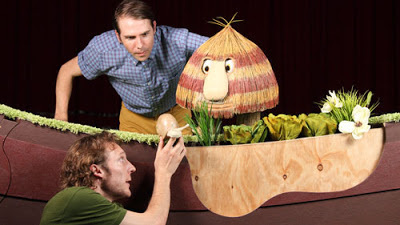 Review of Grug: We loved it! We saw Grug last week, and in all of the hub-bub, I neglected to write about our reaction to it. We loved it! (As did my pals and compadres at the NYC Dad's Group. You can read a great review by The Jason Greene at the NYC Dad's website). As predicted in my preview about the show, it was beautiful, well-done, kid-friendly, with an amazing set and puppets. The New Victory did not disappoint! Before the show, the actors interact with the audience, and it was very nice for the kids to get to know the actors before they did their thing. My son was surprisingly unshy with them, and told them all about how Spiderman shot webs, along with the proper finger motions. They were appropriately fascinated. I asked them who Grug might be in the US, (ie Grug is to Australia as _______ is to the US) but they weren't sure. Maybe Max from Where the Wild Things Are. Or Little Black Sambo, but without the racial overtones. Grug has a number of shows left, and we highly recommend you see them. They have some daytime shows as well, and for those with kids not yet in school those will be great bets to get in and out of Times Square easily. I was very pleased to see that they had some of the Grug books available. You could buy them for around 3.50 each, or a little bit less if you bought more. I bought 4, but they had a set of 14. Although we loved the show, we did not buy the Grug plush doll that they had. There is a limit to our consumerism after all! One of the best parts about seeing the show was running into some school friends. A couple of AA's school mates also were at the show (and we hadn't coordinated it!) So afterwards we went to our favorite midtown Falafel joint (Maoz, at 43rd and 8th) for some lunch. Anyway, if your kid is under 5, they are going to love Grug. And so will you!